Canyoning is to descend a river. You will walk, swim, abseil, jump, slide, down climb. You may forget your life, learn better who you are, have emotions, have fun and enjoy the nature. We can help you decide the canyon which is best suited to your ability. Your guide may also decide on the day to change the canyon for descent to ensure your safety and maximum enjoyment. Factors can include, weather, canyon conditions, your ability level on the day. A swimsuit, shorts, thermal T-shirt, cereal bars, a drink (in a plastic bottle). For a full day, add a portable meal. It’s better not to bring your valuable items. Yes, if it is waterproof. Can I bring my glasses? Yes, if you need them and bring an attachment cord. Contact lenses are fine. It helps to have good water confidence, please tell us if you are not confident or you cannot swim. Don’t worry, we will find a solution. 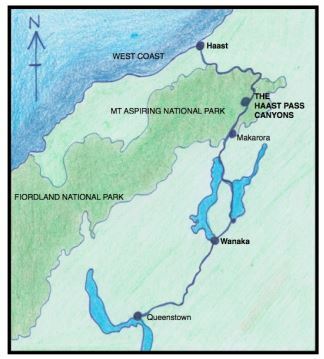 All are located on the Haast Pass section of Highway 6. We will confirm the meeting point with you at the time of booking. Our guide/s will travel each day from Wanaka. These are recommendations only and will depend on the participant. It is also a requirement for a parent or an adult guardian to be on the descent with them. We take a maximum group size of 5 participants. Bigger groups available on demand.